At SLB Pipe Solutions, our goal is to service Indianapolis with long-lasting pipe inspection, cleaning, repair, and replacement that customers are pleased with. When your Indiana drains are experiencing pipe problems it can be easy to ignore them, but it is important when you notice these problems to call professionals right away. Most pipe problems are larger issues that go unnoticed because pipes are not visible to home and business owners on an everyday basis. Sewer and drain pipes are essential to your property’s function which means that when they are not working at all, it is a major inconvenience. It can be an even bigger convenience when your pipes need full-replacement. Our team at SLB Pipe Solutions cares about our customers and making their pipe replacement process go as soon as possible. In the past, sewer and drain replacement involved excavations that ruined residential, commercial, and municipal properties. Excavation is a process where trenches are dug across a property to find pipe systems and replace them. The excavation process was a guessing game that would leave home and business owners with destroyed landscape, sidewalks, parking lots, driveways, and roads. Indianapolis residents would not want to seek professional help because of the collateral damage that came with pipe replacement. 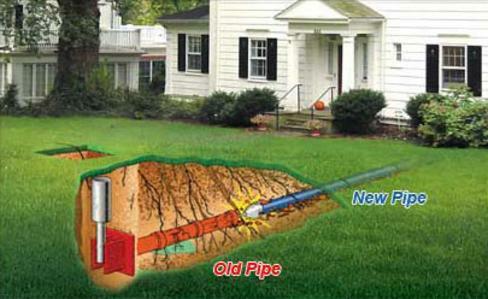 Fortunately, our team at SLB Pipe Solutions uses noninvasive and efficient sewer and drain replacement methods. At SLB Pipe Solutions, our team performs a sewer camera inspection at the beginning of every appointment with Indianapolis customers. Sewer camera inspections are quick and easy. The process begins with our team locating the nearest cleanout hole to your drain. If they cannot find a cleanout hole, they will dig an access point on their own. When the access point has been established, our team will insert a high-definition waterproof camera into your drain. It is moved through your pipe line via a flexible rod, and as it moves through, it provides our team with a live feed of your pipe’s interior. Sewer camera inspections will reveal your collapsed pipeline and its exact locations, so it can be replaced. The most reliable form of pipe repair that our team at SLB pipe solutions services Indianapolis customers with is pipe bursting. Pipe bursting is a trenchless technology that fully replaces your pipe with no excavation needed. To conduct trenchless pipe bursting there needs to be two access points: one for entry and one for exit. The pipe bursting process involves a bursting head with a new pipe attached to is being inserted into your pipeline. As the bursting head is moved through your pipe, it breaks it up and pushes it into the surrounding soil. Bursting heads come in many different sizes depending on the diameter of your pipe system. When the bursting head has moved all the way through your pipes, there will be a brand-new pipe in place of your old one. To finalize the process the bursting head is detached from the new pipe and our term will fit the pipe to an existing one. Our team at SLB Pipe Solutions services Indianapolis and the surrounding areas with speed and professionalism. Pipe replacement does not have to be a difficult process thanks to pipe bursting technology. There is no need to struggle with pipes issues when you can call our team of specialized experts today for assistance.